This past Saturday I traveled down to Hampton, Virginia to attend my first NekoCon anime convention. The convention took place over the November 3-5, 2017 weekend although I was only there for one day. This medium-sized con is located near the ocean and had a lot of nice locations nearby and a lot of food options to choose from within reasonable walking distance. The highlight of my day was probably the Anime SanKyoudai concert which featured Anisong singers Aimee Blackschleger, Joe Inoue, and Diana Garnet. It was just a really fun, energetic concert and it's just a shame that there wasn't a bigger turnout in the audience for it. The Masquerade cosplay contest was also a great event with some really great skits and included a fun Closet Cosplay Contest for the half time event. The Closet Cosplay Contest consisted of two audience members who had 15 minutes to come up with a cosplay/character with the clothing scraps that they are given and the winner is chosen by the audience's cheers. Overall it was good day. I do wish that they had "End of Line" signs to let people know where to line up for events, and they did have some kind of snafu which resulted in the 2017 convention T-shirts not being delivered in time so I wasn't able to pick up a con T-shirt like I usually do. But overall, I had a good time and will probably return sometime in the future. 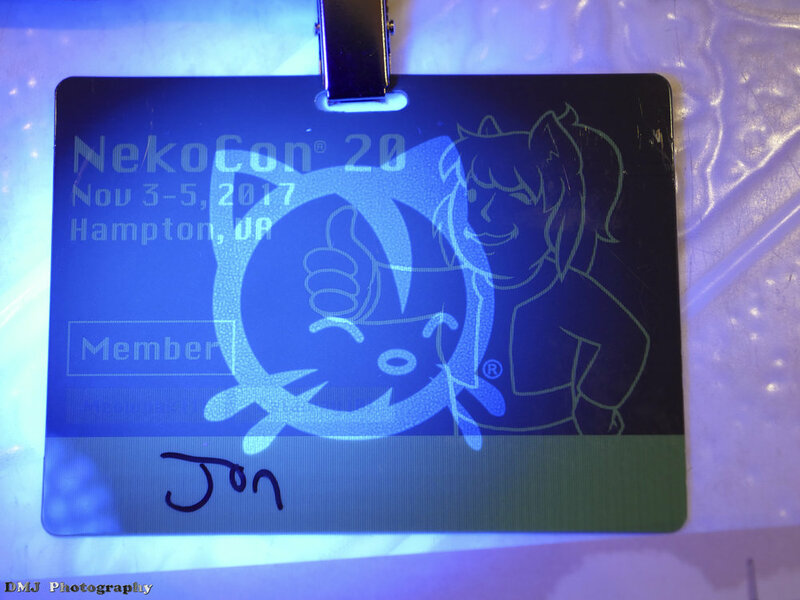 One interesting thing to end on is the fact that the NekoCon membership badges have a hidden Neko logo that is revealed when you shine an ultraviolet light on it. It made for a quick and easy way for staff members to validate your badges and makes for a neat hidden Easter egg. Click here to go to my Facebook photography page where I uploaded photos that I took from the RWBY/Roosterteeth and My Hero Academia (Boku no Hero Academia) cosplay photoshoots. Click here to go to my YouTube channel where I uploaded the videos that I recorded from the Nier: Automata panel featuring voice actors Kyle McCarley (9S) and Kira Buckland (2B), the Anime SanKyoudai concert (pending resolution from the music copyright flags), and the full Masquerade cosplay contest (pending upload at the time of this article's publishing).